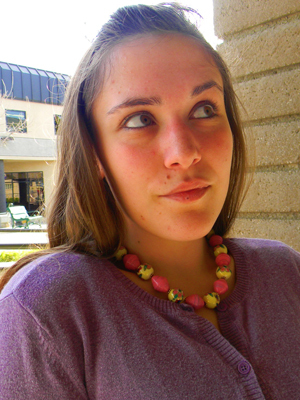 Painted in pink paper beads just spells spring and summer. 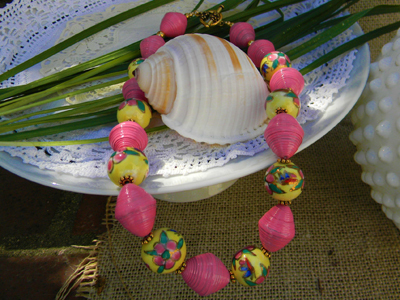 I love these painted beads, they make coordinating them with other beads easier. 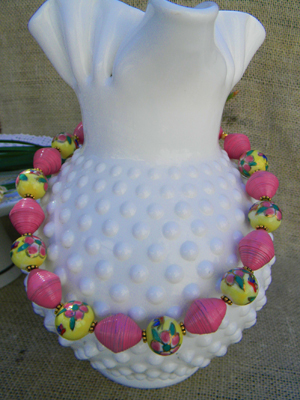 The colors in this Springy necklace can easily be seen in the profusion of flowers I find in my walk around our neighborhood. Hi Janice Mae! I am somehow not getting your updated posts…am going through all the ones I have missed lately. Started a new job and have been extremely busy…so now to figure out the problem and get your posts again! This neclace is simply stunning!!! You guys are amazing with your creations!!! I love this necklace. No flowers yet here in the midwest so your spring creations hit the spot. these beads are really pretty! this gives a very ”girly” bracelet!…Long live the spring!